As much as we love dogs, there is a very messy, smelly drawback to our canine companions: their, ahem, biological waste. In large cities where lots of residents have dogs and even more pups run around owner-less, the poo can quickly cause a disgusting problem. This is apparently the case in some parts of Mexico. According to the video below, the streets and sidewalks are positively littered with dog waste. Internet company Terra has launched a rather inventive way to combat the problem: by offering free public wi-fi in exchange for doggy doodoo. In a promo video that is clearly meant to be at least somewhat humorous, the plan is laid out for dog owners and concerned citizens alike. 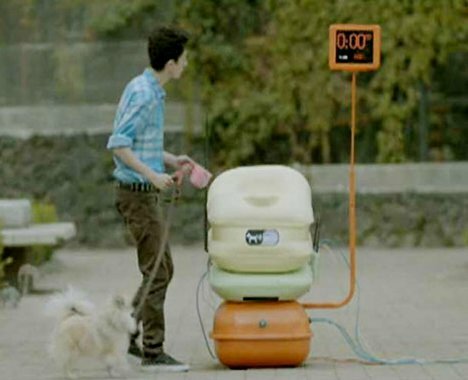 Terra offers weighing stations and wi-fi hotspots in public parks. When a deposit is made into one of the receptacles, a wi-fi hotspot is activated for everyone in the area to use. More poo gets you more time. The video doesn’t explain where the dookie goes after it’s dropped into the bin, but there are some things that it might be better not to know. See more in Phones & Mobile or under Gadgets. May, 2012.